I just love this story! Two blind cows are BFF (Bovine friends forever). For the full story check here! Our girls love bananas too! 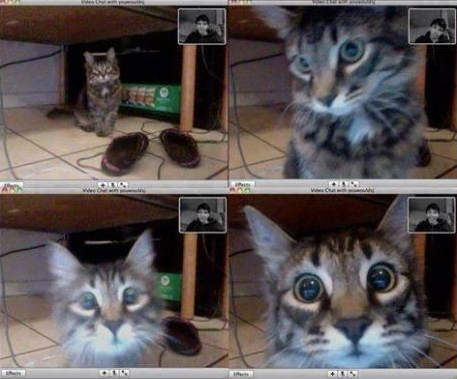 Cat Recognizes Owner on Video Chat! Yes it's another new arrival! He found us on November 1, 2014. He's about 5 months old and he's called Jemmy! What a cutie he is too! Murphy and Jemmy are getting along just fine and it's just 2 weeks now! Jessica couldn't be bothered a bit and JemJem seems to know the boundaries with her! No doubt she will keep him in line! Our beautiful little girl Jessie! I can't believe she will be 2 soon. I just love her sooooooo much! Roger had been here for 5 weeks and 3 days. It feels like he's been part of the family forever! I am learning to speak guinea pig and Roger is doing great! He gets a big room to play in every day and we have a few little games we play too! He hasn't stopped eating since he arrived! What a cutie he is! I love him so much already I can't believe it!